In praise of knowing what you’re talking about. Which we probably don’t. As well all know, and knew days in advance of the official announcement, Paul MacLean is the Ottawa Senators’ new head coach. In the days following the unofficial announcement by the Ottawa Sun (who always arrive prematurely, if you know what I’m saying), we’ve heard the overwhelmingly positive analysis – i.e. he’s been a part of a winning team, he commands respect, he’s a former NHL player, he’s a player’s coach, he’s a communicator, he has a moustache – and a few grumblers – he’s never been a head coach in the NHL, he…has a moustache. This post isn’t meant to fall on either side, but directly through the middle, into the creamy pit of mediocrity between. Which is to say: do any of us, CCFR or otherwise, really know how to assess a good coach in the NHL? Spezza had a brief comment at the end of the year about how important communication is and how it was an area where Clouston needed to improve, and now it’s on the lips of all armchair assessors of coaching talent. MacLean, we understand, is a communicator. And who better to assess his communications skills than Bryan Murray, who seethes with contempt for the media, and started the very press conference announcing MacLean with a joke that nobody understood or laughed at? Who better than Murray, who so thoroughly bungled the Heatley debacle in the public arena? Who better than Murray, who generally displays a lack of appreciation or understanding of the importance of effective PR in the overall perception of a franchise? Over the course of a season we see a little bit – a very little bit, actually – of how a coach’s strategy plays out. We learned that Clouston insisted on playing Gonchar on his wrong side, for example, and we can blame that for Gonch’s career-worst season, though we might not be right. (i.e. he’s also 64 years old.) And we can look at Guy Boucher’s unorthodox tactics and attribute Tampa’s success to it, though again, we might not be right. (i.e. Dwayne Roloson.) So I submit to you, dear reader: if you count yourself among the apparently very many people who approve of MacLean’s hiring, why is that? 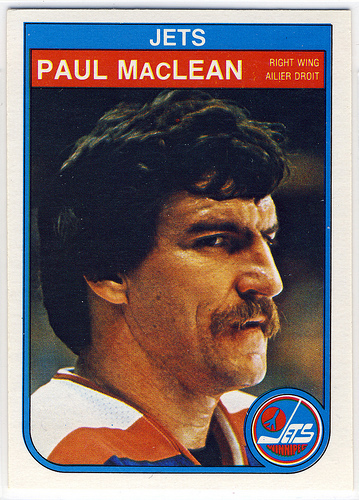 What is it about Paul MacLean (who I personally had never heard of until about two weeks ago) that has you excited? I think most fans who approve of this move(myself included) gauge this against what the general media and the interwebs has to say on the matter. The general concesus that I’ve read on non-Sens specific webs is that MacLean appears to be a good fit and isn’t short on the skills needed to be a successful head coach. I like the move now and reserve the right to modify that judement in the future. Nope! Of course we didn’t. You think we do anything more than google image search someone’s name around here? Except that we know how we’re assessing Rundblad. He scored more points in the SEL than any other defenceman, so we presume he’s good. Makes sense. What is it we’re using to assess MacLaren? Maybe it really is that he’ll do better because the team (might be) better. Pedigree in place up to this point is what Im saying. Rundblad has done well up to here, MacLean has done well up to here. He was an assistant on very good Detroit and Anaheim team and got coach of the year in some bling blong league i cant remember. Its not like Assistant coaches dont do anything. But the assessment seems to be he’s done very well and won at the various levels he’s coached/assistant coached at so we presume he’s good…now he makes the jump to head coach. . . and we see from there.